While wandering—but not lonely as a cloud—in the northeast quadrant of Mopac and US 183 on February 27, 2013, I photographed the latter stage of the familiar vine known colloquially as old man’s beard, Clematis drummondii. It’s appeared in these pages probably a dozen times, but never with as dramatic a skyscape as the one from that day two years ago. I’m still away from home (barely). You’re welcome to leave comments, but please understand if I’m a bit late in answering. I was impressed with the sight too, Shannon, and was glad to be able to record it. Well, I sure hope you don’t mind if I share it next Monday on my Mish Mash post. Cheers! And I with it in making this testimonial image. I love it, this one says something! It says a LOT of things! The more things the better, Elisa (assuming they’re good things). Love the connection between land and sky. You are very good at this. Gracias, Georgette. Sometimes I think I should adopt Connections as a middle name. Lovely capture with a delicacy of nature’s hand. That’s what I aim for, Tom, and sometimes I get it right. 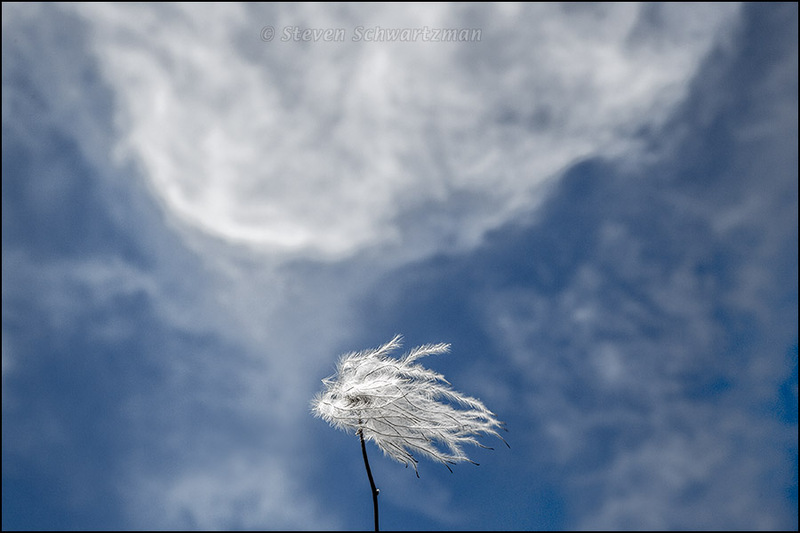 I love the whimsy in this one, with the resonance between the wispy cloud and the wispy beard. The photographer’s beard would have been too much of a good thing, so I stopped at these two. Fabulous! This must be one of my all-time favourites Steve! Thanks for letting me know, Cathy. Hope spring comes early in Bavaria this year. Despite your postings of ice, snow, and frostweed, this feels like the most wintery photo in your oeuvre. The blue and white are as pristine as a bright, winter day after a fresh snowfall, and the clematis strands resemble frost. It’s beautiful. Today is an appropriate day for wintery, alas, with the thermometer in my yard in Austin reading barely above freezing. That wasn’t my intention when I scheduled this picture in January, but I’ll agree the blue calls up cold quite well. Thanks, though I wish I could say the same to my valise, which has gone missing. Maybe the airline will still turn it up, or maybe not. I’d never entrust anything important (like cameras, photographs, laptops, phones) to checked baggage, but rebuying lost clothing will still be a nuisance if the bag doesn’t materialize. You’ve given me leave (I hope) to place this among the jewels of nature photography in Austin. I seem to have struck something good here. Ethereal is a word I used to use a lot, and a good one to bring up here. Is this the ‘Antipodes’ you’re talking about? Hi, Jane. I thought perhaps you’d inadvertently put a comment here that was intended for someone else, and so you did. This past fall I was in Phoenix and Tucson but never made it southwest of those places to the desert near Ajo. Maybe someday I will. Clap, clap, clap–till my hands hurt! I appreciate your enthusiasm, Gary, (and your novel way of expressing it), but not at the expense of calloused hands. My first thought was that it was a cloud in front of another cloud. The wispy Clematis looks like you’ve captured a cloud on a stick. Very dreamy. Now that’s a great description: a cloud on a stick. Dreamy it is. I love the simplicity of this image Steve! Simplicity can be a virtue, Michael. Thanks. This is quite a unique, and I imagine neck challenging, shot. Great sky as a backdrop for this beard in the wind. I’m all for uniqueness, Steve. My neck has a bend in it that will never go away. And my haiku that goes with the image. Thanks, Steve, for the borrow! It’s a great shot. Still one of the most mesmerizing and dreamlike images I’ve seen anywhere. Trust you to see this perfection and capture it so sweetly. Thanks and thanks again, K.I. That’s saying a lot. This is a really impressive shot. The repetition of theme, color, and movement is wonderful. Great job!! That’s a good analysis of the picture, Ann. I approve. I’ll call it a hit, Susan. This has become something of a “golden oldie.” Glad you like it.